Nothing beats a perfectly cooked steak over a charcoal grill or campfire. 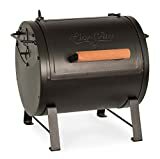 This list fo the Best 5 Outdoor Charcoal Grills of 2018 offers backyard chefs access to the best-designed grills for outdoor cooking this year. Whether you are looking for a classic Kettlebell style or want to cook over an open fire this list will lead you to a variety of options to take your grilling to the next level. No matter your budget there is a durable, outdoor cooking option that will not only lead to great tasting meals but will also last for years. Tailgaters and apartment grillers will love the simple, compact design of this basic propane grill by Char-Broil. Users can grill up to eight hamburger patties at the same time. When not in use the legs rotate to hold the lid securely in place for transport of storage. Char-Broils lightweight design can be brought along for camping trips and tailgating parties where you want food to be its best. The chrome plated grill surface is quick to remove and is dishwasher safe. This portable grill is suitable for use with either 14.1 ounces or 16.4-ounce propane canisters. Even with the convenience and popularity of electric grills nothing truly replaces the taste and texture that comes from charcoal grilling. This is where the Sportsman’s Charcoal Grill by Lodge comes into play. Lodge has been making cast iron cooking pans for decades giving outdoor cooks access to quality and dependability. This hibachi style design allows for multiple cooking heights helping keep food cooking at the proper temperature. A cleverly designed draft door allows users to adjust heat and keep charcoal happy no matter how much you cook. The cast iron coating is pre-seasoned making this grill ready for cooking right out of the box. Available in three different grill sizes this portable yet durable grill is perfect for campfire cooking. Heavy duty enough to support cast iron cookware this fire grate offers home cooks a way to take their culinary skills outdoors. Fold up legs make it easy to tuck into the car for car camping trips or days spent at the lake. 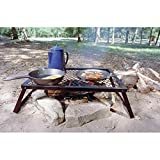 Whether you like to cook steaks over an open fire or just want to brew a pot of coffee while camping, the Texsport Campfire Grill makes these tasks easier. The durable steel mesh grill top will last for years to come leading to many wonderful camping memories for you and your family. This is the grill that started it all for Weber, this design has become an icon. Backed by a ten-year guarantee the Weber Kettle Grill will hold up to many weekends spent barbecuing with family and friends. Providing 22.5 inches of cook space this grill is a good option for parties where burgers and hotdogs are dished up all night long. Emptying charcoal has never been easier with Webers updated one-touch cleaning system. The damper design helps cooks control temperatures while grilling with the closed top design utilized by this grill. Enamel coatings and attention to detail ensure that this grill will resist rust and stand up for years. This device is the perfect grill for people who not only want to cook burgers but are also interested in smoking meats. The Char-Griller Tabletop Grill features an offset design allowing for Texas-style smoking as well as traditional grilling. A cleverly designed ash drawer helps cut down on the mess that can be caused by charcoal grills. Cast iron cooking grates evenly distribute heat and are easy to clean after use. Whether you are a tailgating fan or just like to host neighborhood parties, this grill by Char-Griller offers the ultimate solution to the need of one device that offers both grilling and smoking.